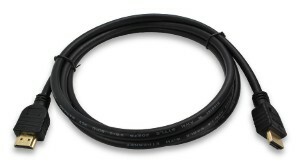 Use these HDMI cables to interconnect high-definition video equipment (video cameras, DVD players, HDTV's, computer monitors, etc.). They come in a variety of lengths and feature standard HDMI male Type A connectors on both ends. All pins and ground connections are gold-plated. The HDMI connectors are shown. These cables support the latest HDMI standard (v1.4), including the new Audio Return Channel and HDMI Ethernet Channel. These cables are also compatible with previous versions of the HDMI specification. They are Category 2 certified, meaning that they are classified as 'High Speed' HDMI cables which support full 1080p resolution. This cable uses the standard HDMI connector (Type A Male) on each end. The dimensions are listed below.